A fixed bed reactor is filled with solid media to facilitate the formation of biofilms with anaerobic bacteria. Frequently, the synthetic media used are the same as those in trickling filters (Fig. 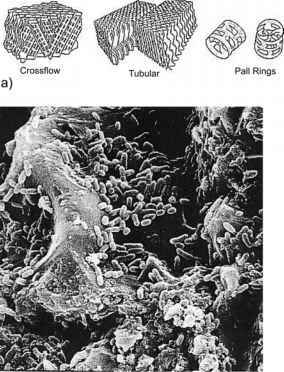 8.7a; Young 1991) or, alternatively, they are porous polyurethane particles with a diameter between 0.3 cm and 1.0 cm and are used with inner surfaces for bacteria immobilization (Fig. 8.7b; Spieß 1991; Kus 1993). Examples of such support materials are shown in Fig. 8.7. The surface area for bacterial growth is about 100 m2 m-3 with a void volume fraction of 90-95% (Grady et al. 1999). The formation of biofilms and the two-phase flow must facilitate liquid/gas separation and must avoid blockage by thick biofilms or large suspended sludge particles. For these reasons, the wastewater is recycled to increase the flow rate and shear stress inside the fixed bed (Fig. 8.8a). Fig. 8.7 Media for immobilization of anaerobic bacteria. (a) Non-porous synthetic media (Young 1991). (b) Immobilized bacteria on porous polyurethane particle. Excess sludge is normally rinsed out with the effluent. If blockages occur, the flow rate of the recycle flow must be increased temporarily. 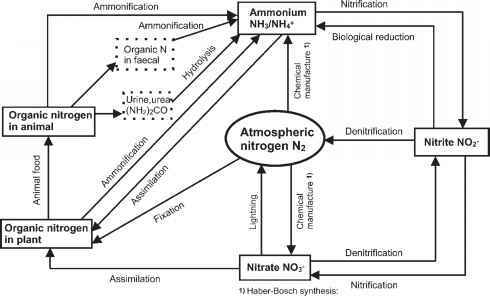 In some cases, the advantages of the UASB and the fixed bed reactor - the establishment of high bacteria concentrations by granular particles and the formation of biofilms near the effluent to reduce the loss of bacteria - are combined (Fig. 8.8b).